Lang is a lecturer in The University of Texas at Austin’s College of Liberal Arts Humanities programs and a former part-time project archivist in the Archives and Visual Materials Cataloging Department at the Ransom Center. He has a PhD in Medieval English Literature from Washington University in St. Louis, with a background in medieval and early modern English paleography and interests in digital editing and collaborative publication. He was employed to assist in the processing of the Carl H. Pforzheimer collection of English manuscripts from 2012–2014. 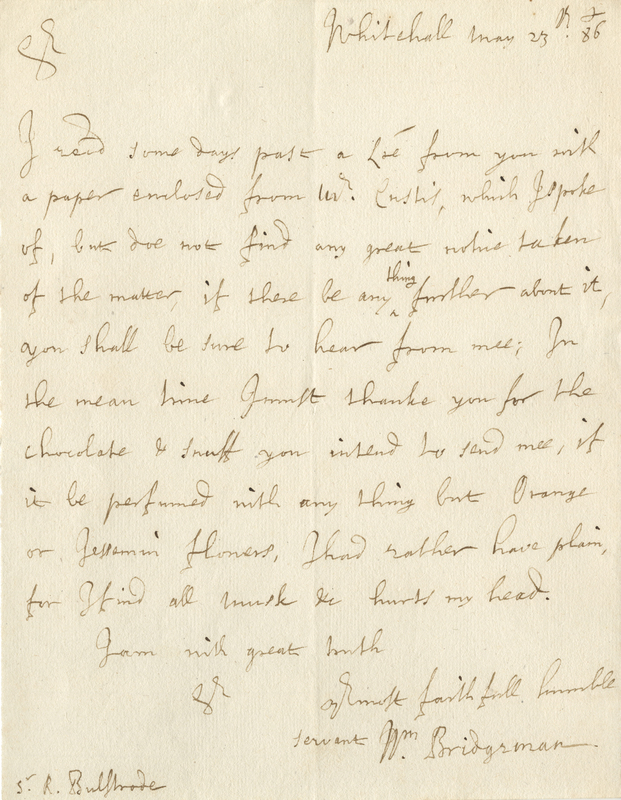 I must thank you for the chocolate and snuff you intend to send me, if it be perfumed with anything but orange or jessamin [jasmine] flowers, I had rather have plain, for I find all musk etc. hurts my head. 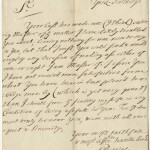 In a series of over 150 letters that the Ransom Center is publishing online as part of the Carl H. Pforzheimer collection of English manuscripts, clerks from England’s Office of the Secretary of State reveal the intimate relationship they enjoyed with one of England’s chief diplomats in Northern Europe during the last quarter of the seventeenth century. This diplomat was Sir Richard Bulstrode, a nobleman loyal to the Stuart dynasty throughout his life, who fought on the side of the Royalists during the English Civil Wars and supported the Jacobites after the Glorious Revolution of 1688. He was an immensely pragmatic and skilled lawyer and politician who managed to maintain official government positions even during the Commonwealth Period. Passages from letters like the one quoted above illustrate just how Bulstrode’s political savvy operated. He and his agents took care to interweave practical and personal matters into his official dealings with his government superiors and their clerks. For example, it seems like it was quite common for Bulstrode to procure luxury commodities from the markets of Europe for these clerks as a favor for keeping him up to date on significant political news from London. 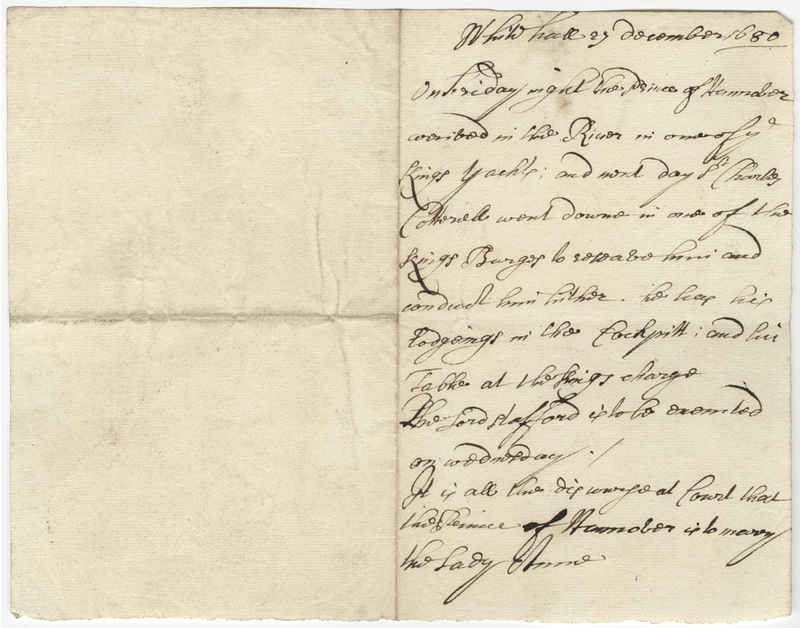 As can be seen in the second item pictured below, which is part of a series of official communiqués that ask him to perform certain diplomatic tasks for the realm, the clerk acknowledges receipt of a chocolate and snuff shipment in between news about the apprehension of a military embezzler in Bruges and the results of an important trial involving the Church of England (PFORZ-MS-0318). Newsy tidbits in letters were not the only way Bulstrode kept his finger on the pulse of English politics, though. These letters represent just one small part of how Bulstrode sought to satisfy his voracious appetite for news. His main sources for current events from his homeland were handwritten newsletter services. 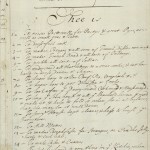 At the Ransom Center, 1,469 newsletters that were sent to Bulstrode between 1667 and 1689 comprise the largest portion of the Pforzheimer collection of English manuscripts. Originating in London, these newsletters form direct parallels with the letters from the Secretary of State’s office in that they reveal the same sorts of personal relationships that Bulstrode fostered with his official correspondents. 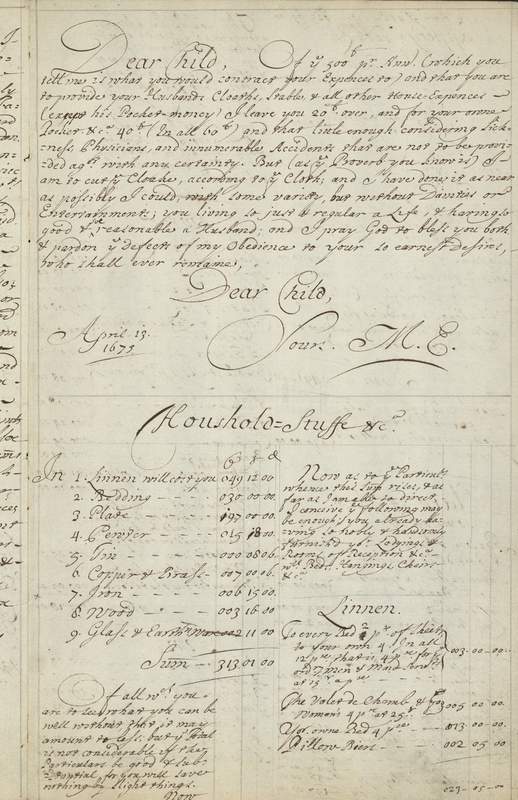 For example, in two newsletters from 1679 (PFORZ-MS-1008 and PFORZ-MS-1023), a clerk includes personal notes thanking Bulstrode for sending chocolate to him and his boss, Sir Joseph Williamson. Williamson was able to provide his subscribers an insider’s perspective on current events because, along with his journalistic enterprises, he also served a term as Secretary of State and maintained a high position at Court. Surviving manuscript newsletter collections the size of Bulstrode’s are rare and significant to historical research. This is because, until 1695, there were no independently printed newspapers in England and only one official Gazette controlled by the government. People in Bulstrode’s era who wanted uncensored news had to rely on what could be gathered from personal correspondence through the thrice-weekly post. To meet the growing demand for reliable reporting, a few entrepreneurs in London set up newsletter services to mail proprietary information to subscribers about proceedings in parliament, activities of the military and royal family, and court gossip that could not be printed in the public newspaper. Bulstrode subscribed to two different newsletter offices that are represented in our collection. 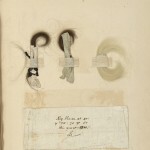 The smaller of the two sets is from the office of Edward Coleman, who was executed for treason during the anti-Catholic fervor stirred up by Titus Oates in the autumn of 1678. The larger set is from the office of Sir Joseph Williamson, who, as an entrepreneur, was deeply connected to the burgeoning printing industry in London, and, as mentioned above, also served as Secretary of State from 1674 to 1679. The way Williamson set up his service, subscribers paid annual fees based on how frequently they wished to receive newsletters, but they were also obliged to mail accounts of news and politics back to London from their estates around the realm or stations in Europe. If subscribers were diplomats like Bulstrode, they received discounted service rates but were asked to send both first-hand accounts and printed newspapers from their localities. This information not only provided newsletter offices with news for future letters, but—for Williamson—it also provided valuable intelligence for his statecraft. Taken together, these letters and newsletters in our collection preserve one of the world’s largest records of early correspondence journalism. 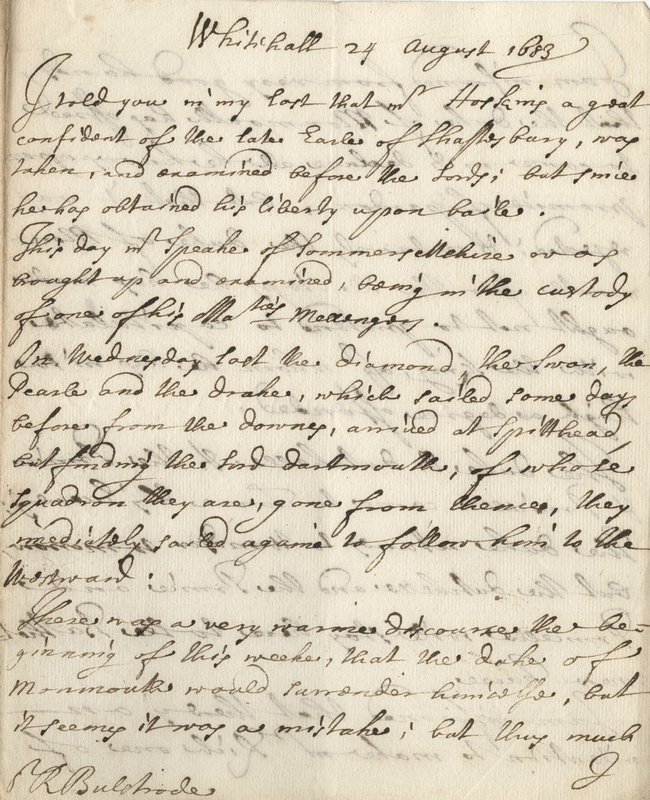 Historians like Professor James Winn of Boston University are using the wealth of information in the collection to study the details of the Restoration period of English history. 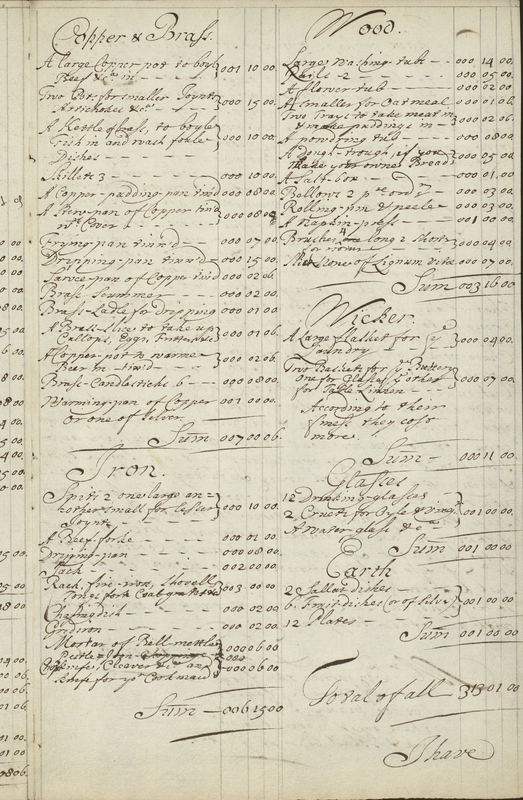 In his forthcoming book on Queen Anne of Great Britain, for example, Winn is using these documents to help pin down the precise course of events that led to Anne’s marriage to Prince George of Denmark. This match for Anne occurred after a rumored engagement to Prince George of Hanover (who became her successor to the throne), and an unwanted courtship by the Earl of Mulgrave. 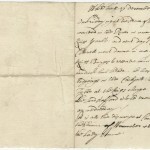 In the two newsletters from February and December 1680 pictured below (PFORZ-MS-1133 and PFORZ-MS-1219), the writer reports about Anne’s rumored engagement to George of Hanover—which turned out not to be true. Newsletters from autumn 1682 (such as PFORZ-MS-1392) reveal how Mulgrave’s pursuit of Anne may have gotten him expelled from court. 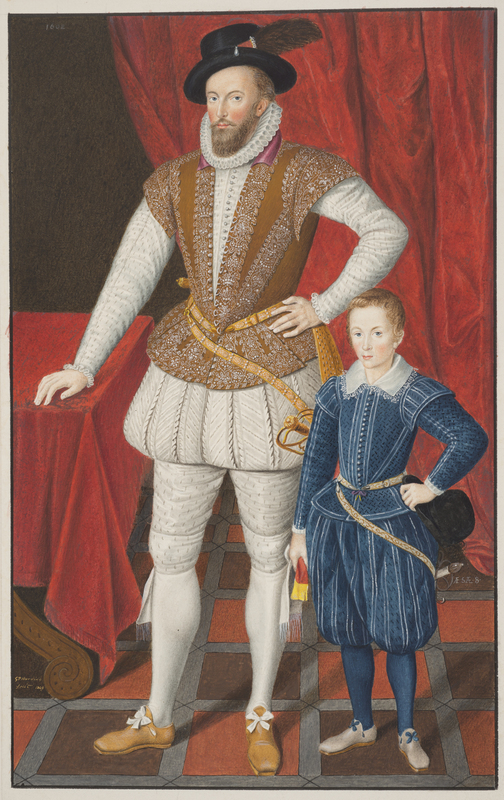 Fortunately for Mulgrave, after Anne’s marriage to George of Denmark in July 1683 (discussed in PFORZ-MS-1460), Mulgrave staged a political comeback. 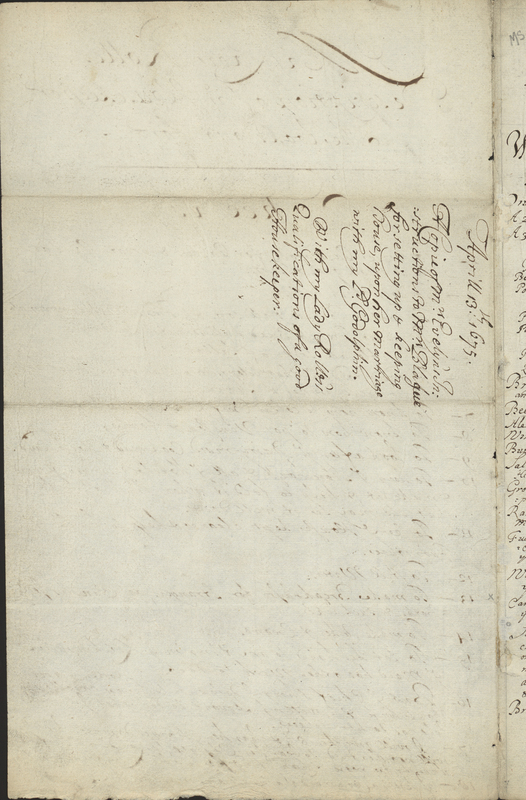 As the newsletter from August 20, 1683, describes: “The Earl of Mulgrave has kissed the king’s and duke’s hand, and does now make the Court very constantly” (see PFORZ-MS-1466). There was a very warme discourse the beginning of this weeke, that the duke of Monmouth would surrender himselfe, but it seems it was a mistake; but this much [break] I am informed from very good hands, that the duke of Monmouth has offered to come in & declare all he knows upon promise of pardon, but that it was rejected; & certainely the duke of Monmouth after the ill steps he has made ought not to pretend to capitulate with the King, ag.t whom he has in so high a degree offended. The Ransom Center’s digital publication of the Bulstrode letters and newsletters marks the first time a large collection of seventeenth-century newsletters has been made freely available to a mass viewing audience with item-level descriptions. While the newsletters have been commercially microfilmed and partially transcribed in the past, these publishing efforts have all been incomplete and out of chronological order. This has made using newsletters for research incredibly difficult for scholars. 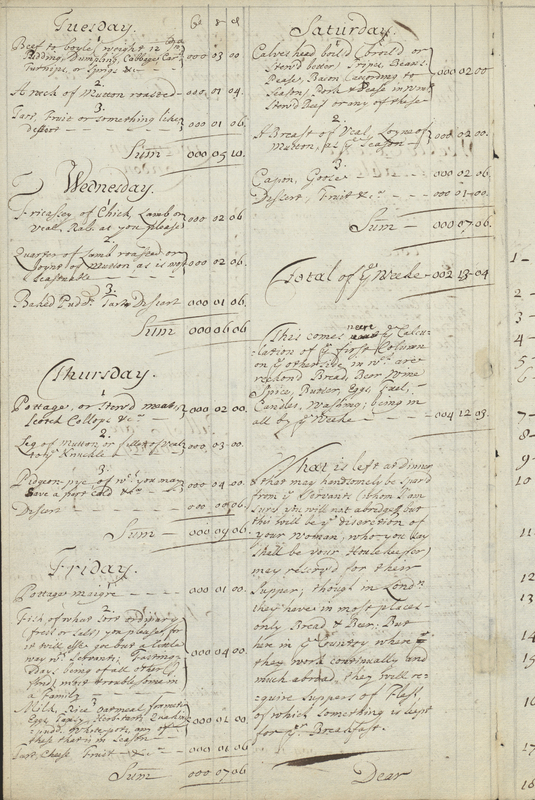 As part of the Ransom Center’s effort to describe and digitize the Pforzheimer collection, the Center reorganized all 1,469 letters by date and recorded all of the days mentioned in each newsletter in database records for each individual item. One consequence of this activity has been the discovery of over two dozen “lost” newsletters that had been neither microfilmed nor transcribed in the past. 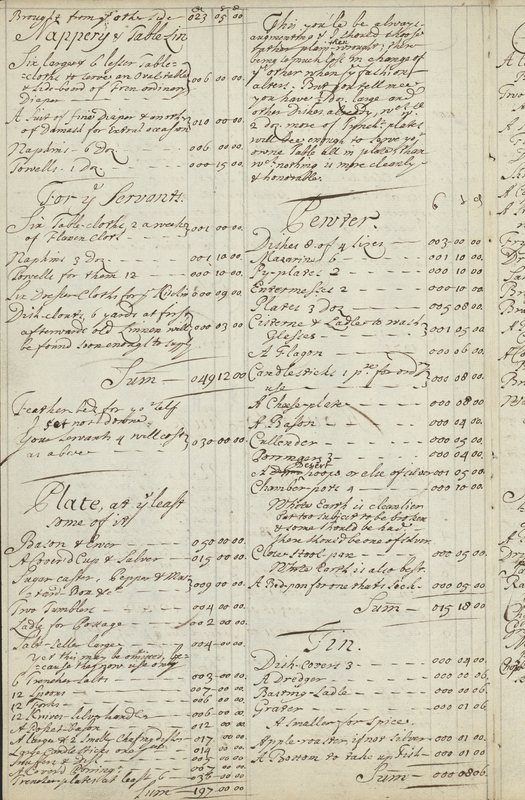 The Center’s cataloging and digitization efforts will provide unprecedented levels of access to primary source documents for seventeenth-century history. 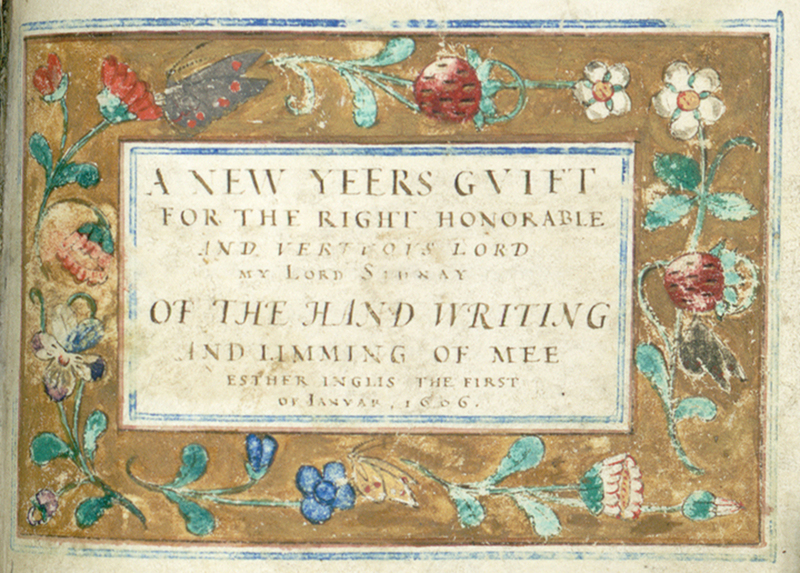 The online publication of the Bulstrode newsletters, along with the Pforzheimer collection of English manuscripts, will provide a needed service to scholars and teachers and open up information to readers looking to discover important details and ephemera about English politics and culture during the Restoration. 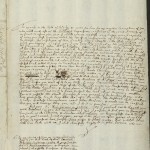 As other archives that hold major newsletter collections—such as the Folger Shakespeare Library—begin to publish them with item-level descriptions online, the Ransom Center will be able to open the door to a reexamination of an origin narrative for independent correspondence journalism in England. 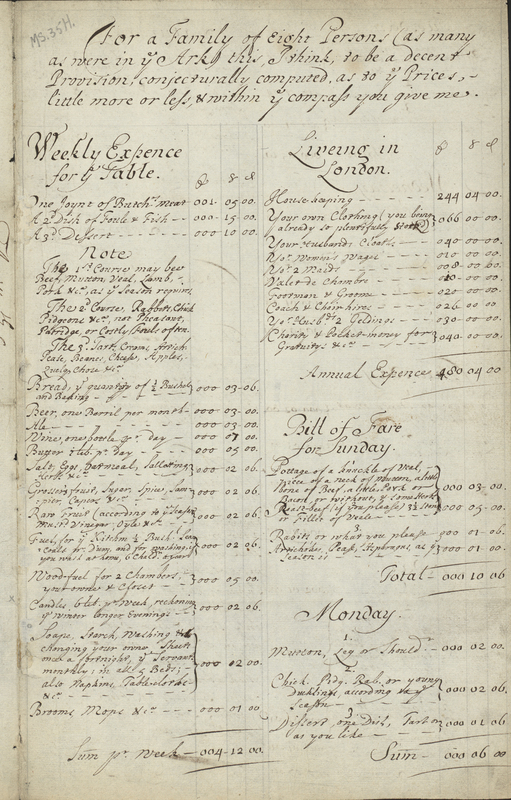 According to Mary Evelyn, the wife of John Evelyn, a renowned English intellectual, diarist, and horticulturalist in the late seventeenth century, it cost £313 and 1 shilling to set up a proper upper-class household for eight people in London in 1675. In today’s dollars, the dishes, silver, glasses, linens, and kitchen equipment required would cost approximately $62,000—without buying any furniture. It would then cost £480, 4 shillings per year (approximately $95,000/year today) to maintain and staff that house and a small, two-horse stable. 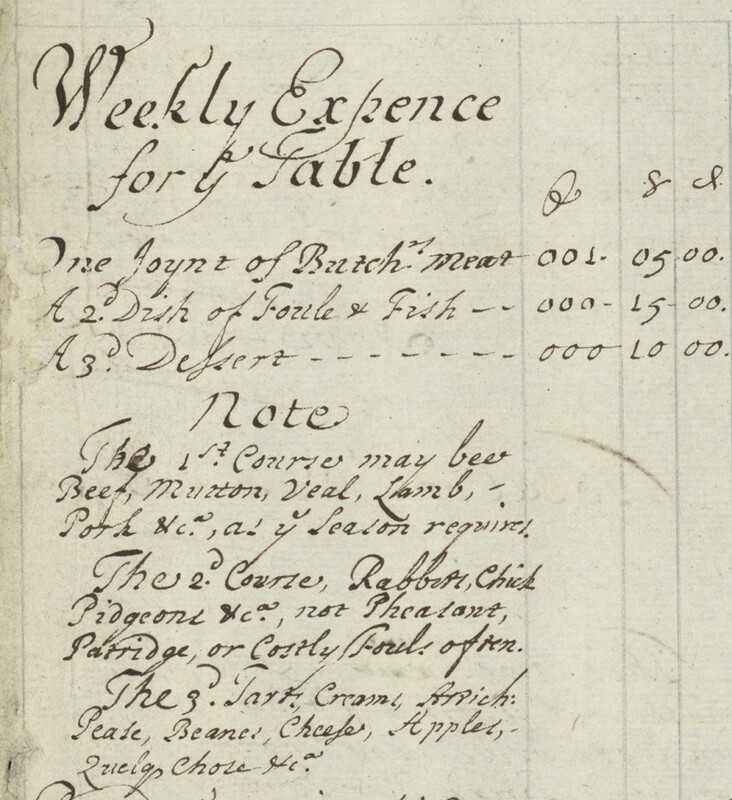 This household would then have a weekly budget of £2, 13 shillings, 4 pence for meals and £4, 12 shillings, 3 pence for other household supplies like soap, candles, and fuel (approximately $1,444 today). if you have a faithful Woman, or Housemaid it will cost you little trouble. It were necessary yt such a one were a good Market-woman, & whose Eye must bee from ye Garret to ye Cellar; nor is it enough they see all things made cleane in ye House, but set in ord.r also; That if any Good be broken or worne out they shew or bring it to her that she may see in what Condic?n it is, that nothing bee hid or imbezel’d. Use as seldom Charewomen and Out-helpers as you can they but make Gossips. She should bee ye first of servants stirring and last in bed, & have some authority over ye rest, & you must hear her and give her credit, yet not without your owne Examination & inspection, that Complaints come not to you without cause. It is necessary alsoe she should know to write and cast up small sums & bring you her Book every Saturday-night, which you may cause to be enter’d into another for your Selfe, that you may from time to time judge of Prices & things w.ch are continually altering. This Servant is to keep your Spicery, Sweet-meats Cordial waters [etc.] & ye rest of ye Servants are to account to her; & such a Server (I tell you) is a Jewel not easily to be found. The recipient of these instructions, Margaret Blagge Godolphin, was renowned in her own time for both her beauty and religious devotion. In her teenage years, she was a Maid of Honor to the Queen in the court of Charles II. 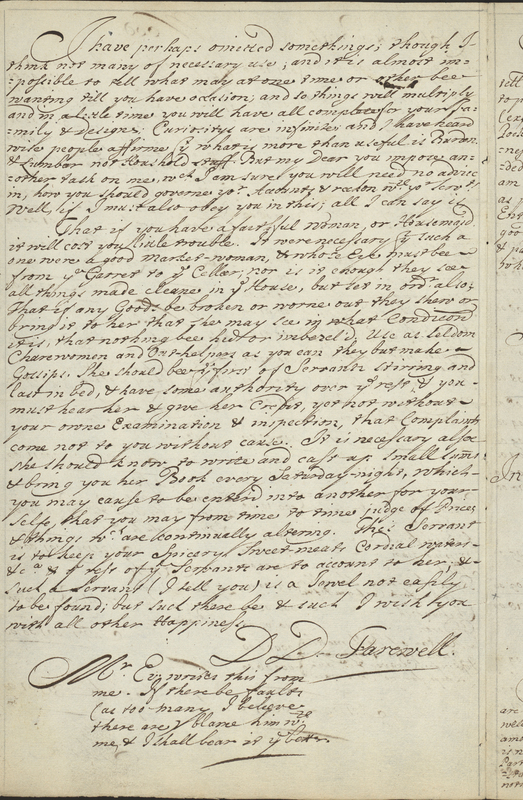 Her letters demonstrate her success at establishing a circle of admirers and friends at court, John Evelyn among them, but they also reveal an extreme frustration with the moral depravity of her fellow courtiers. She was especially impatient with her superiors’ endless card games and fashionable worldly activities that kept her from her prayers. After several years she managed to get away from the Restoration Court to serve Lady Berkeley but was soon obliged to go abroad with her while Lord Berkeley served as the English ambassador to the court of Louis XIV. From Paris, she wrote to John Evelyn of her admiration for the cloistered life of nuns even though life among Catholics exposed to her the superstitions of the Roman Church and confirmed her Protestant faith. 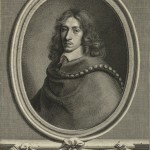 Despite her desire to dedicate herself to a life of religious devotion after her time in Paris, John Evelyn—who had become a sort of spiritual mentor to her—persuaded her that her most pious act as a 22-year-old woman would be to follow through with a long-term engagement to be married to Lord Sidney Godolphin, the King’s Master of the Robes. Not long after marrying, Margaret Godolphin asked the Evelyns for help with her home economics. 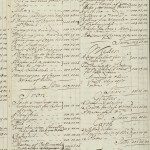 This seven-page document thus reveals Mary Evelyn’s attempt to help her devout young friend establish a household that would provide her a refuge from the world of high society she found so tiresome. By Margaret Godolphin’s own account, it worked. 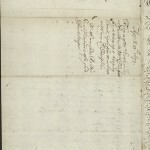 She wrote of her thankfulness for the blessings she was able to enjoy after her marriage: her health, her husband, her time to herself, and her “house quiet, sweet, and pretty.” Sadly, Margaret’s enjoyment of this place of respite and meditation was cut short when she died after giving birth to her son Francis in her third year of marriage. 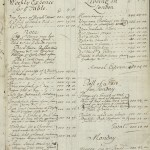 Thus, this document reveals the trust John Evelyn placed in his wife Mary’s expertise in planning, budgeting, practical math, and management skills, and provides a fascinating glimpse into the details of how a small upper-class London home operated in the late seventeenth century. 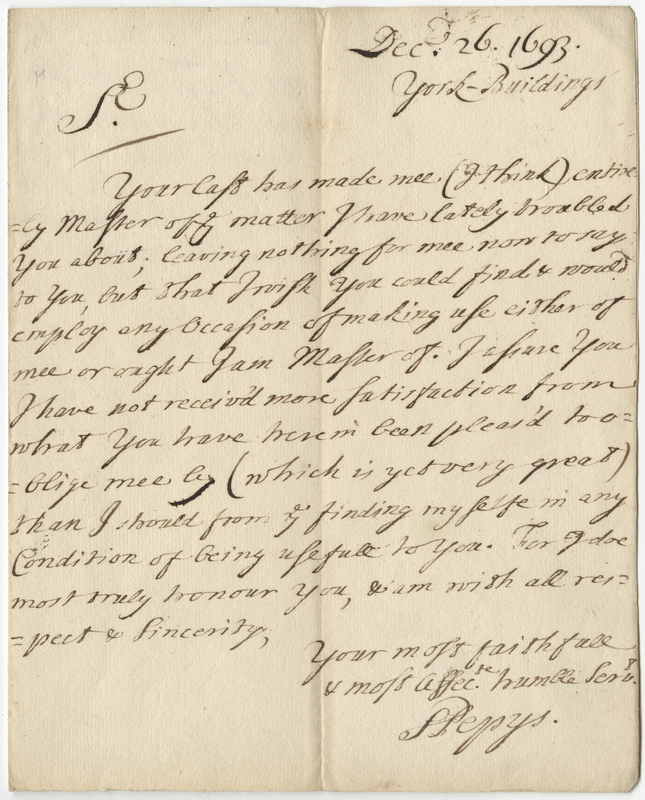 Its cover letter to Pepys also provides a context that allows us to glimpse this document’s status in its afterlife as a kind of talisman that preserved for the Evelyns a tiny bit of the intimacy and spirituality of their friendship with the young Margaret Blagge Godolphin. 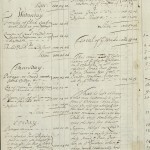 Transcriptions of Mary Evelyn’s Household Management Instructions are provided by Catherine Harris and Patrick Naeve, student volunteers from The University of Texas at Austin’s College of Liberal Arts Plan II Honors Program. 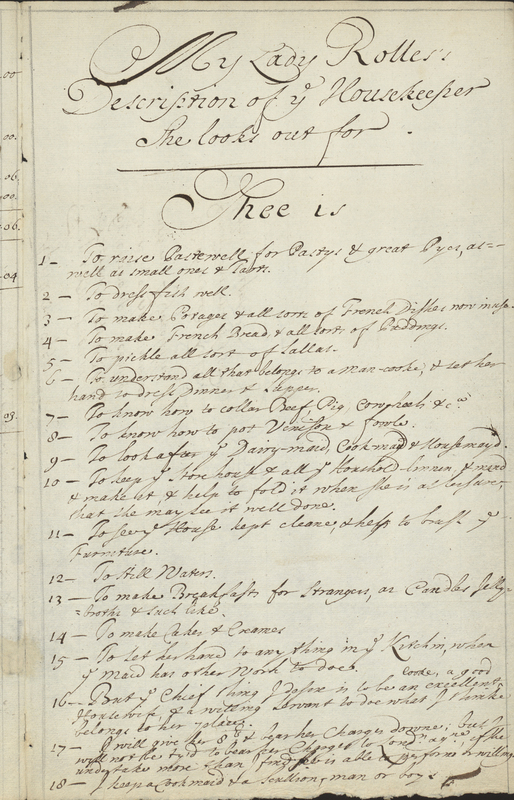 Page from Mary Evelyn’s instructions on how to set up a household in London in 1675. 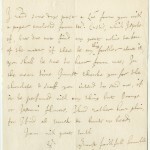 Enclosed letter from John Evelyn to Samuel Pepys, from 1685. 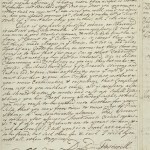 The Ransom Center recently published a new finding aid for one of its richest collections of early manuscripts: the Carl H. Pforzheimer collection of English manuscripts. The bulk of the manuscripts were acquired in 1986, along with 1,100 other rare early printed editions of English literature that form the Pforzheimer library. 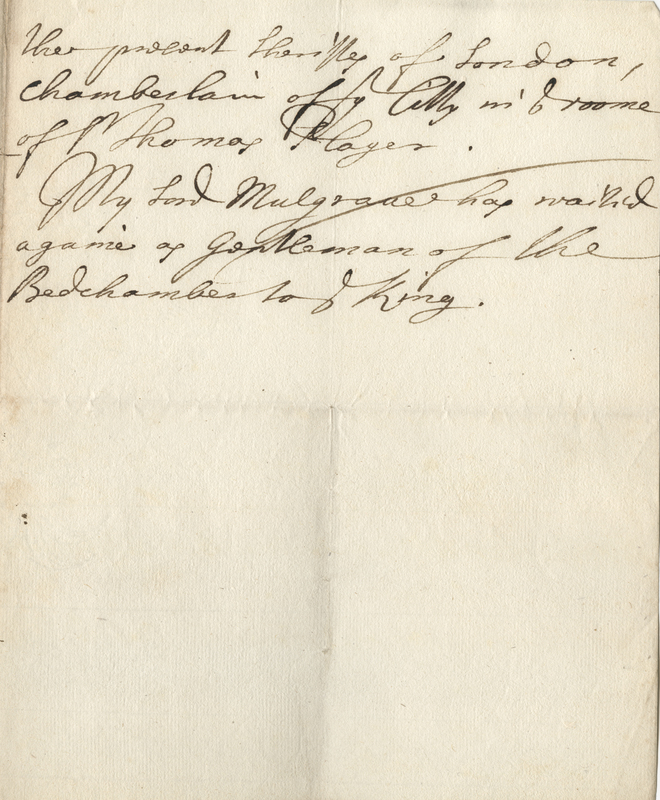 The manuscripts include nearly 2,000 items dating from 1485 to 1844 that feature original correspondence from European monarchs, nobles, and aristocrats. 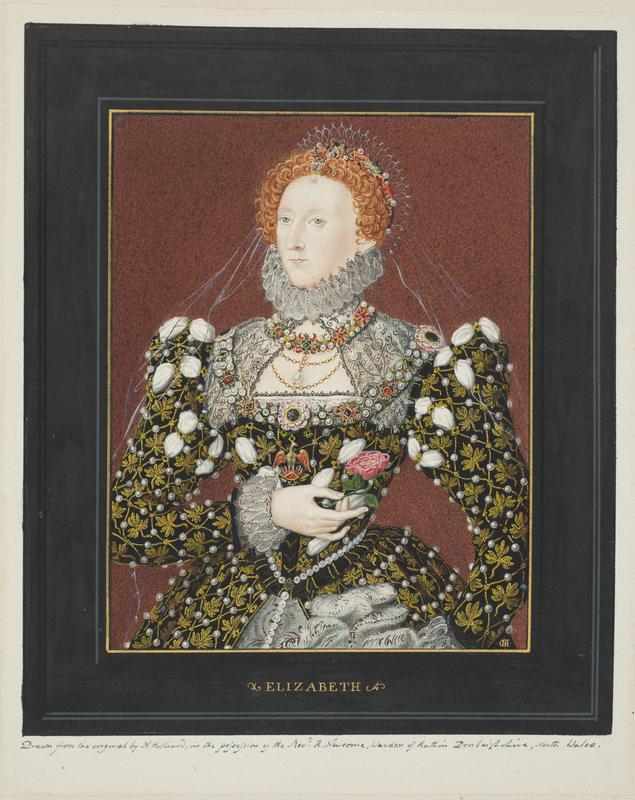 Represented are works and letters by notable figures in British history such as Oliver Cromwell, John Donne, Queen Elizabeth I, John Evelyn, John Locke, Samuel Pepys, and Sir Walter Raleigh. 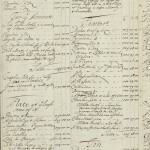 The new finding aid represents the first-ever online description of the Center’s Pforzheimer manuscripts and provides a new wealth of detail about the collection. 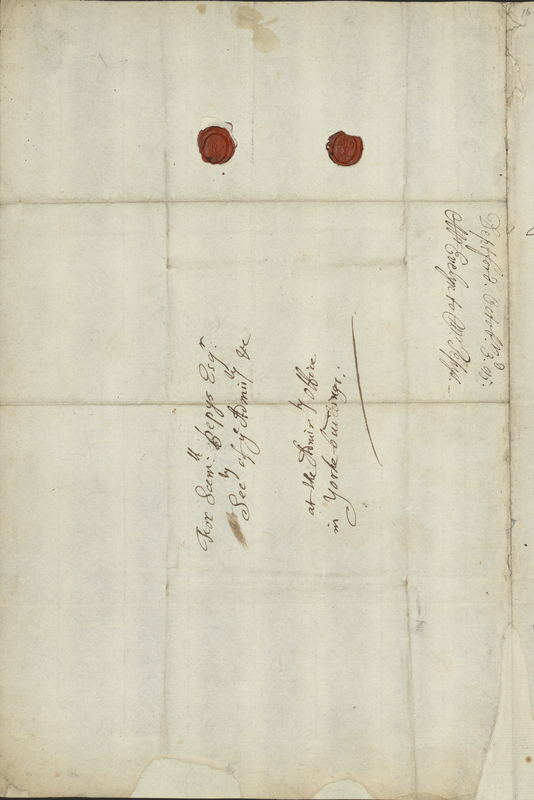 Each manuscript has been individually cataloged, and digitization of all of the Pforzheimer manuscripts is ongoing. As digitization is completed, the descriptions and images will be added to the Ransom Center’s publically available digital collections. The Pforzheimer manuscripts have several thematic strengths. 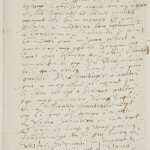 For example, there are letters signed by Queen Elizabeth I relating to the ultimately failed negotiations for her marriage to François, Duke of Anjou. 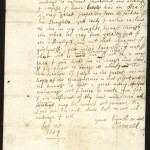 Another theme encompasses letters and documents signed by participants in the regicide of King Charles I of England, including two letters by Oliver Cromwell. 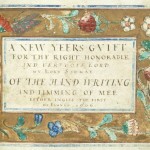 Another grouping is anchored by a significant collection of letters by philosopher John Locke and additional letters by other English Enlightenment-era thinkers from the late seventeenth and early eighteenth centuries. Several founding members of the British Royal Society are represented in this group, especially Samuel Pepys and John Evelyn—two famous diarists of the period who provide modern-day historians with first-hand perspectives on English culture, politics, and science in the period. 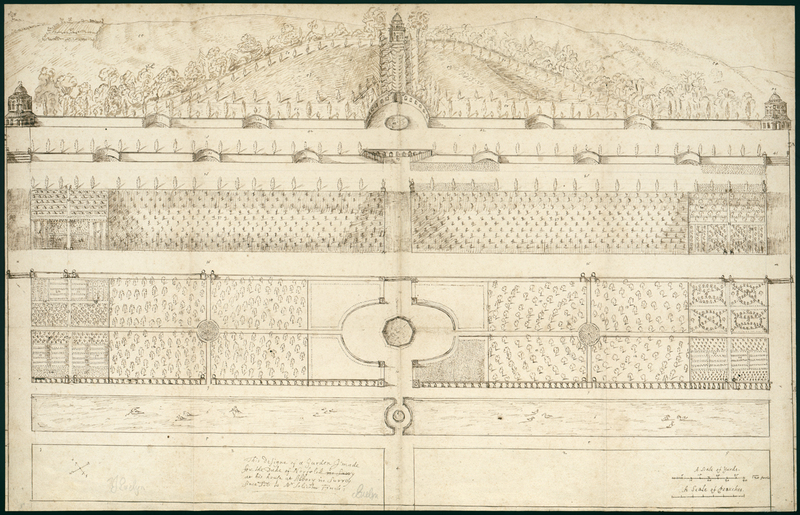 Among Evelyn’s materials are original hand-drawn sketches of gardens and naval battles, and letters to colleagues discussing the classification of herbs. Another highlight is a beautifully extra-illustrated 1833 biography of Sir Walter Raleigh, created by nineteenth-century collector John Dillon to hold his extensive collection of original manuscripts by Raleigh and his contemporaries along with nearly 500 rare prints and original art. 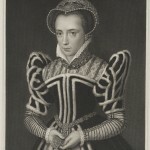 Other items of significance to the history of art and literature include letters by seventeenth-century poet John Donne and eighteenth-century playwright William Congreve; a rare early seventeenth-century copy of Edmund Spenser’s Shepheardes Calendar translated into Latin; and a vellum handwriting showcase book from 1606 by Esther Inglis, one of very few known women calligraphers of her era. 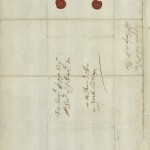 There are also two letters by members of the early Quaker religious movement, Margaret Askew Fell Fox and Isaac Penington. 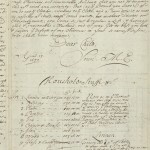 The largest group of manuscripts in the collection originated from the Bulstrodes, an aristocratic English family prominent in Middlesex in the seventeenth and eighteenth centuries. 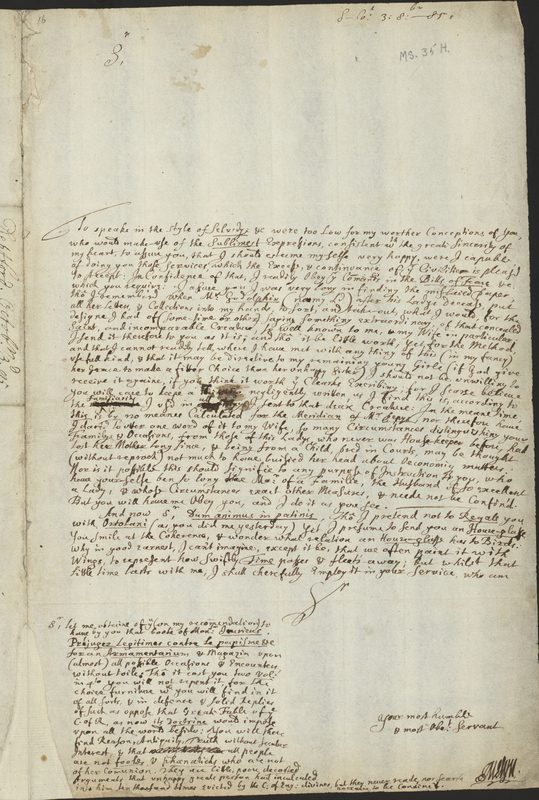 By far the bulk and the most significant of these manuscripts are 1,469 handwritten newsletters dating from 1667 to 1689 received by Sir Richard Bulstrode (1610–1711) while he was stationed in Brussels as an English diplomat. These newsletters provided Bulstrode with information from England that could not be printed in public newspapers, such as parliamentary business. The reportage in the newsletters offers today’s readers a first-hand insider’s perspective on English history and London culture in a tumultuous time. Readers will find reports on England’s involvement in North America, hostilities with the Dutch and French, court hearings about government censorship, parliamentary debates on the right of habeas corpus, the formation of the Whig and Tory political parties, the Popish Plot and persecutions of Catholics, the uneasy succession of Charles II by the Catholic James II, the Rye House Plot, the Duke of Monmouth’s Rebellion, the Glorious Revolution of William and Mary, and accounts of court gossip in the 1670s and 80s that involved Mary’s sister—the future Queen Anne. 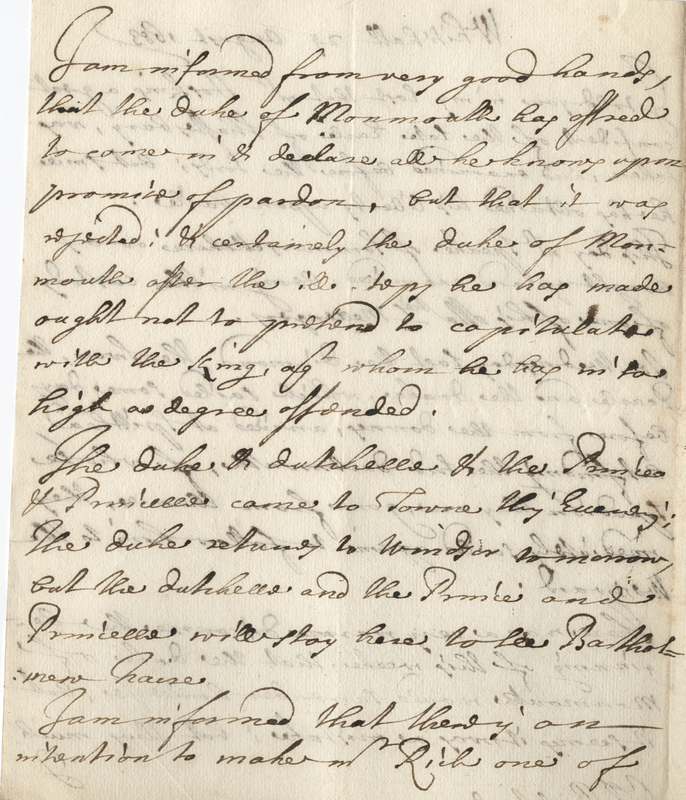 Supported by additional correspondence between Bulstrode, the newsletter office owner Joseph Williamson, and some of Williamson’s clerks, the Pforzheimer collection preserves one of the world’s largest records of early correspondence journalism. 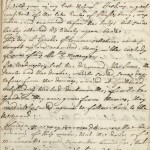 And through its digital collections, the Center will provide access to a large collection of manuscript newsletters from this era, showcasing the immense value these documents have as primary sources for historical and cultural research. 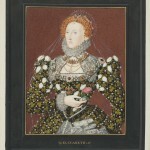 Handpainted engraving of Elizabeth I in extra-illustrated volumes. 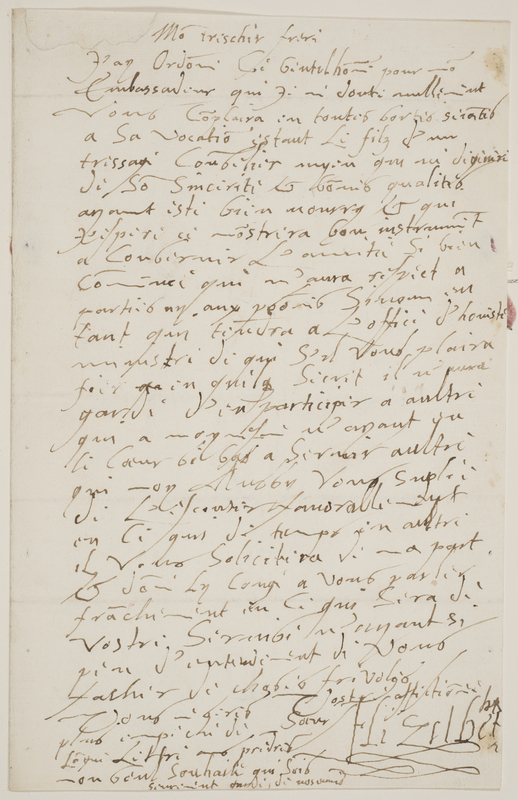 Letter from Elizabeth I, Queen of England, to Henry IV of France, with a recommendation for an unidentified ambassador, undated. 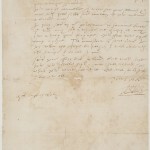 Letter from Oliver Cromwell to Colonel Richard Norton, M.P. 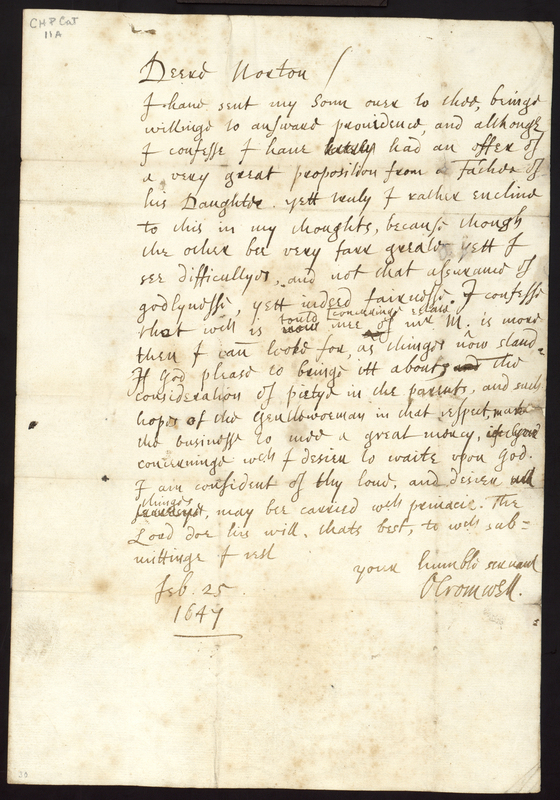 for Hants, about a proposed marriage for his son, 1647/1648 February 25. 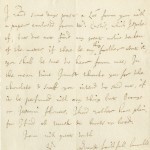 Letter from Samuel Pepys to Sir Isaac Newton, thanking him for responding to inquiries about the hazards at dice, 1693 December 26. 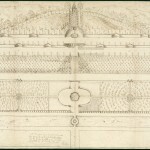 Sketch of a garden for the Duke of Norfolk’s house at Albury in Surrey, 1667, by John Evelyn. 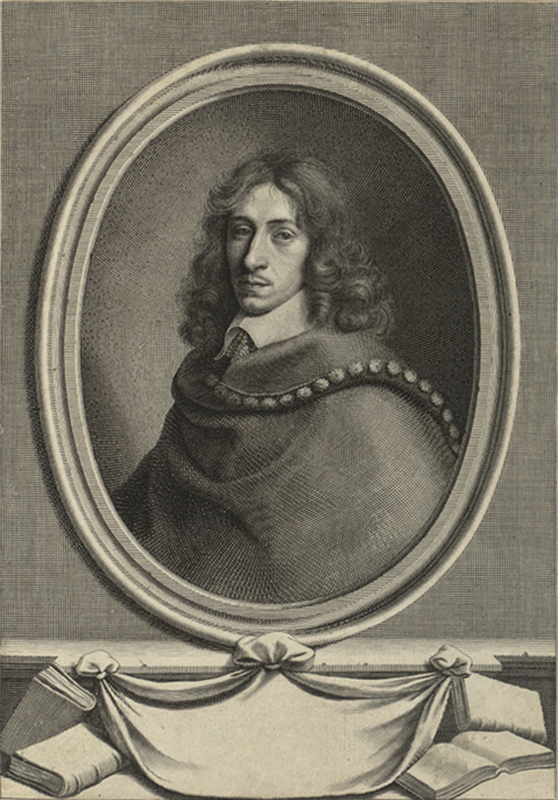 Engraved portrait of a young John Evelyn. 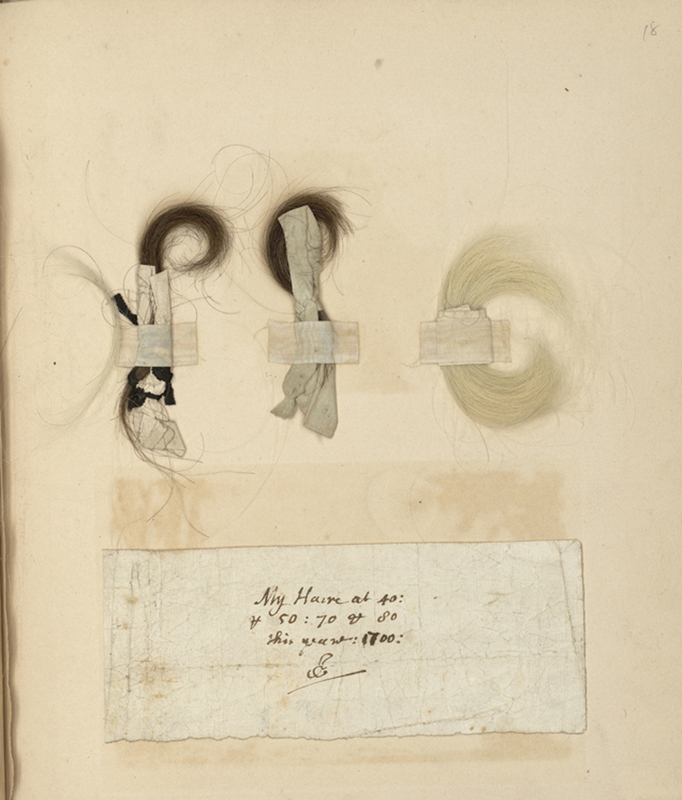 John Evelyn’s hair preserved at three ages in his life. 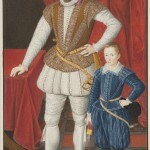 Engraved portrait of Sir Walter Raleigh and son. 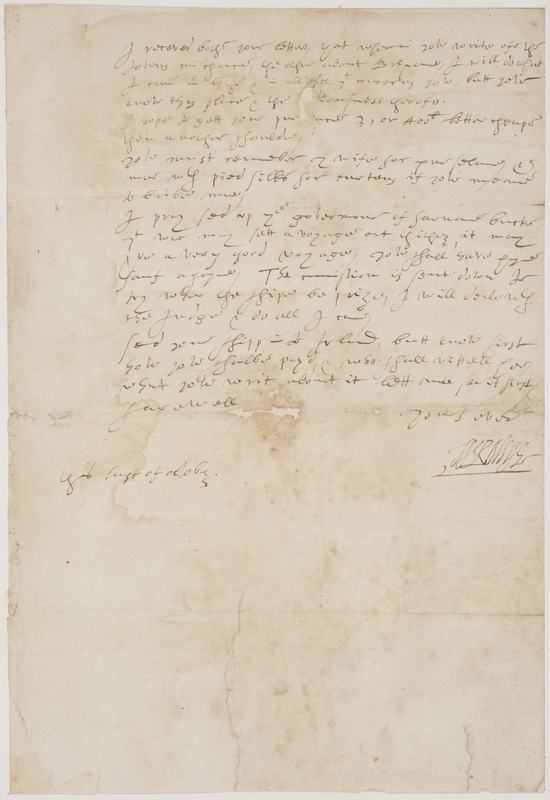 Letter from Sir Walter Raleigh, to Sir John Gilbert, the Younger, encouraging him to set out on an expedition to Ireland once he knows how he will be paid, circa 1590 October 31. 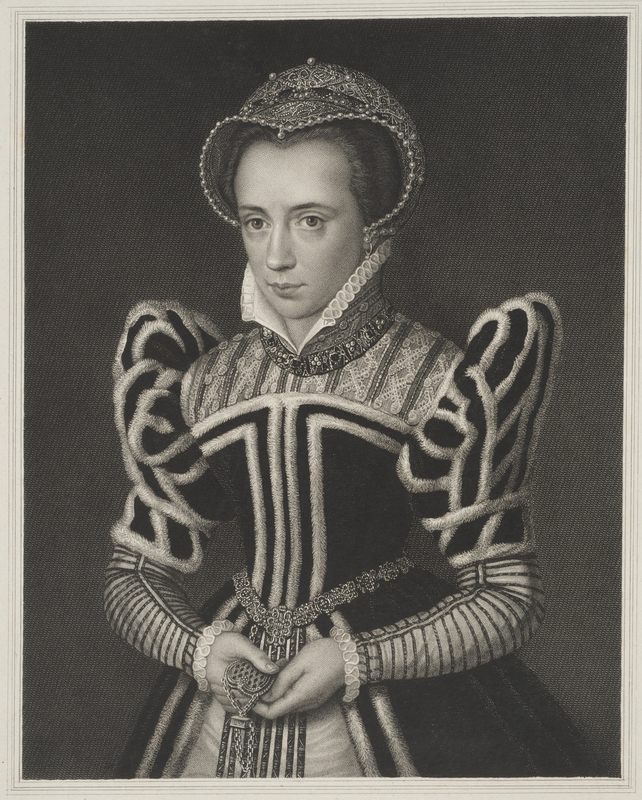 Engraved portrait of a young Queen Mary I.
Hand-drawn title page of caligraphy and illustration sample book by Esther Inglis, 1606. Newsletter from the office of Sir Joseph Williamson in Whitehall, London, to Sir Richard Bulstrode, Brussels, 1680 December 29. 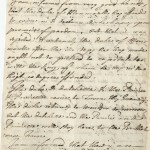 This letter discusses the arrival of Prince George of Hanover in London and the gossip at court that he was to marry Lady Anne. He and Anne did not marry, but he succeeded her in 1714 after her 12-year reign as monarch of Great Britain. 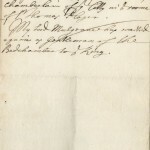 Letter from William Bridgeman, Whitehall, to Sir Richard Bulstrode, Brussels, on behalf of Robert Spencer, Earl of Sunderland and Secretary of State, 1686 May 23. 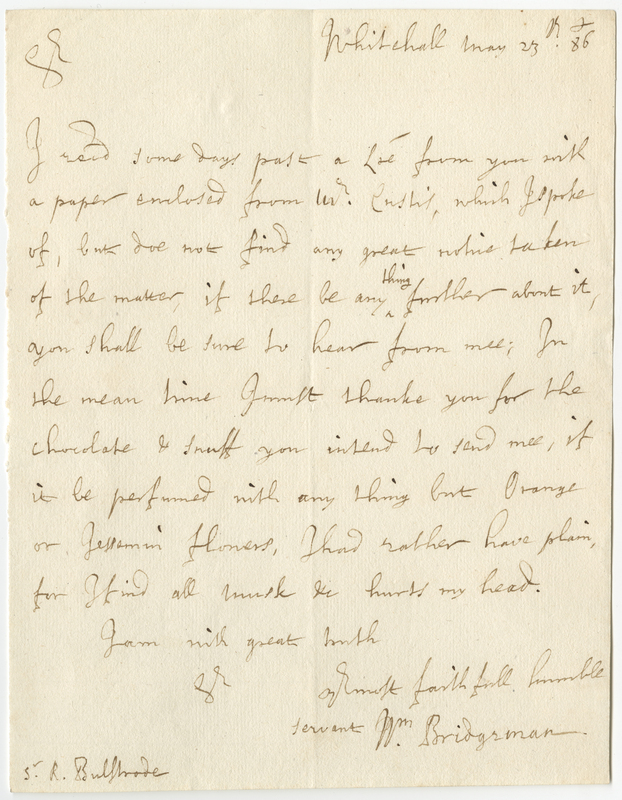 In this letter, Bridgeman thanks Bulstrode for offering to send him chocolate and snuff from the continent, and details his preference for flowery or unscented varieties.